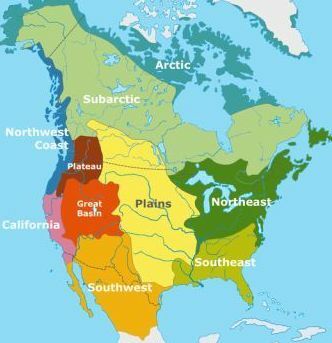 Summary and Definition: The Cree tribe spread across the North American continent. Originally from the Subartic region of Canada and migratiing to the Great Plains and the Northeast woodlands. The names of the most famous chiefs of the Cree tribe included Chief Big Child, Chief Poundmaker, Starblanket, Flash in the Sky, Big Bear, Fine Day, and Chief Cut Nose. Where did the Cree tribe live? The Cree tribe were originally people of the Sub-artic region in Canada whose lands once extended from the Ottawa River to Saskatchewan River. Many of the Canadian Cree Native Indians migrated south to the Great Plains and Northeast woodlands. The Native Indians who inhabited the prairie regions are known as the Plains Cree and those who live in forested land are known as the Woodland Cree. The tribe called themselves Kenistenoag, but this name was corrupted by the French into Kristineaux, and subsequently shortened to "Cree." The Canadian Cree were hunters, fishers and gathers. They lived in houses that were built out of birch bark, as were their canoes. The Plains Cree adopted a nomadic lifestyle, hunting the great buffalo herds and living in tepees made of buffalo hides. The Plains Cree were allied with the Assiniboine and the Saulteaux Native Indian tribes in what was known as the "Iron Confederacy". The Woodland Cree maintained their hunting and fishing lifestyle in the Northeast forest regions living in Wigwams (or wetus), also known as birchbark houses . What did the Cree tribe live in? The Cree tribe lived in birch bark wigwams, aka or wetus, where birch bark was plentiful. On the plains they lived in tepees. What language did the Cree tribe speak? All members of the Cree tribe spoke in the Algonquian language, regardless of their location. What did the Cree tribe eat? The food that the Cree tribe ate depended on the resources that were available in their habitat. Who were the most famous leaders and chiefs of the Cree tribe? The most famous leaders and chiefs included Chief Poundmaker, Chief Big Child, Starblanket, Flash in the Sky, Chief Big Bear, Chief Fine Day, and Chief Cut Nose. What weapons did the Cree use? 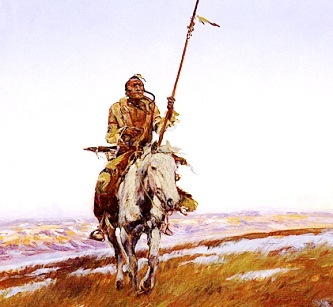 The weapons used also varied according to the natural resources in their areas but included bows and arrows, a variety of different clubs, hatchet axes, spears, lances and knives. What clothes did the Cree tribe wear? The clothes worn by the tribe were dictated by the climate. In warm climates they wore breechcloths in the summer and in cold climates they wore fringed tunics or shirts and leggings. Warm robes or cloaks were also worn to protect against the rain and the cold. The tribe members wore fur or leather caps decorated with feathers but they also wore feather war bonnets and porcupine roach headdresses. What was the religion and beliefs of the Cree tribe? The religion and beliefs of the tribe was based on Animism that encompassed the spiritual or religious idea that the universe and all natural objects animals, plants, trees, rivers, mountains rocks etc have souls or spirits. The people believed in the Great Spirit.